Entering into its fourth delicious year, Black Restaurant Week founder Cynthia Daniels thinks she's cooked up the best package yet. With 14 participating restaurants offering lunch and dinner specials, it's the event's biggest year so far, and the menu offerings are diverse. "Six of those have been opened for less than a year," Daniels says, appealing to adventurous foodies looking to go on a tasting tour. Over the course of Black Restaurant Week, diners visit the participating restaurants of their choice and receive a deal on select items. "It's a limited menu," she explains. "You have a lunch special with two items for $15, and dinner specials are going to be three items for $25." This year's featured restaurants include Sage, the historic Four Way Grill, Bluff City Crab, and Ballhoggerz BBQ. In that sampling alone, regular menu items range from turkey and dressing to salmon sliders and braised short ribs. "And we're not just in Midtown and Downtown," Daniels says. "We've got restaurants in South Memphis, North Memphis, East Memphis, and Cordova." Other participating eateries include The Office@Uptown, G. Alston: The Restaurant, Chef Tam's Underground Cafe, and Two Vegan Sisters. 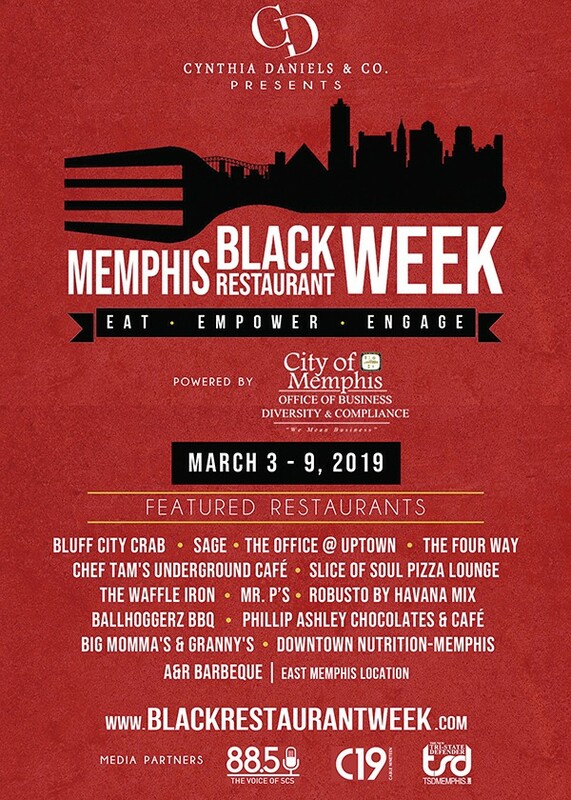 "Also, Black Restaurant Week is for everybody," Daniels says, to make sure there's no confusion in the name of a profile-raising event for minority businesses and an opportunity to spotlight new spots and local treasures. "I think sometimes people might see 'black' and think 'Oh, I have to be black to be part of it.' But it actually helps diversify the restaurants. It's really exciting when we see all ethnicities."